Has anyone changed out the O rings on the oil cooler lines coming out of the drivers side block located just above the AC unit. The twin lines are bolted into the block and drop down from aluminum tubing to hydraulic style hose then proceed to the oil cool in front. The location is right in the middle of "how is this removable". Has anyone done this O ring replacement, and DIY info would be greatly appreciated. What is Startek.com a special headhunter clan??? No one change out the O ring seals???? At the block side wall?? Has anyone attempted to do this? Hello my friend, yes itis in one of those places that can be repaired in short time if the engine is on a motor stand ha ha ha. Was wondering if the ac pump can be moved forward without taking off lines with maybe the serpentine belt and pump fasteners removed. Not much room would be required, I have a 4 post hoist the car sits on for the winter but cannot actually see the total view oil line return connections. 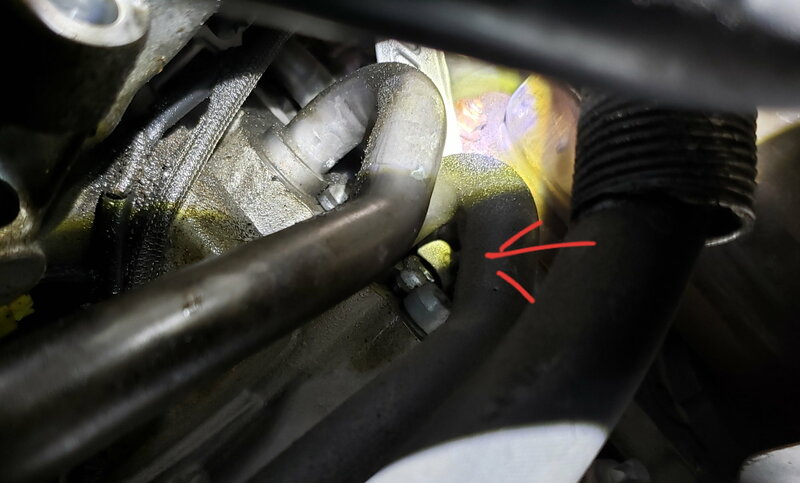 Thought maybe it was a valve cover gasket but still in the unsure mode ? What do you think about the moving of the ac pump ahead a small amount to get the the possible leak area?? That is what we did, we had to remove the refrigerant first, before disconnecting the AC lines, then moving the AC compressor forward to gain some room. Also drain the radiator and expansion tank, to make more room. These O-rings are in a difficult location, we had to loosen the mounting bracket for the oil lines running to the oil cooler. We access some things from the bottom of the car using a lift, and others from the top with the car resting on the ground. It took about two hours total after receiving the parts from the dealership. I bought two of the last three O-rings they had. Once these O-rings were removed, they felt hard and were brittle after 11yrs. And I'm glad that we fixed this, because I could have been on a long road trip and had this happened then, it could have been worse. But we caught it in time, with very minimal oil lose. Plus we discovered the broken neck on the coolant expansion tank, luckily it didn't leak, but if you move it around, you could tell it was broken. Was thinking maybe possible to deknuckle my hands this winter as I do not like the old girl to be leaking. Everytime the car is driven it puts a smile back on my face. Looking to do this, did you have to disconnect compressor or just unbolt? We just removed the serpentine belt and unbolted the AC compressor to gain clearance. Done, now I have clearance but the bolts seem to be partially behind the cylinder head. Picture in a few seconds. I'm now thinking there is a bracket I need to remove? Well to answer my own question, yes that is the power steering bracket and it needs to be removed. Quite an annoying job, on w219 also had to loosen engine mounts and lift engine to remove bolt on one of the line's bracket. Unfortunately, the modern highly efficient 'assembly assembly manufacturing lines do not incorporate 'serviceability considerations. The engine 'long block' is assembled onto the engine mount/subframe, which is assembled into the chassis from below. Thus things that are not of 'routine service' design often require significant 'dis-assembly' of the engine assembly or even un-installation of the engine assembly to replace them. Many times some creativity and 'Yankee Engineering' can accomplish the task differently than the 'assembly line' method and Dealer procedure. For example. my 2002 Infiniti Q45 has a complicated high pressure supply line to the power steering unit that is : steel tubing-flex hose-steel tubing-flex hose-steel tubing with crimped steel hose clamps,numerous tight formed bends in the steel tubing. It passes through the engine cradle and cannot be changed without dropping and dis-assembling the engine and engine suspension cradle. The 'hose assembly' cost nearly $400, and had to come from Korea, and labor is 14 'Book' hours to do the job. I decided to cut the steel tubing in a convenient place and snake the line assembly through the warren and replace all the rubber hose with nitril high pressure industrial hose and rejoin the steel tubing with a $12 double flare steel union. I formed circular grooves with a tubing cutter on the steel tubing ends where the hoses were removed and used high pressure 'Graylock' type hose clamps to ensure no leaks at the hose to steel connections, So for less than $75 total parts. and about 6 hours labor ( I valued at $150/hr)--including finding and purchasing all the fittings and hose- I saved over $1200 from the Dealer quote for the job.